Dans le numéro de cette semaine de Science, un article opportun de mise en perspective traite des problèmes du changement de l’atmosphère supérieure. Ladite atmosphère “supérieure” consiste en la stratosphère jusqu’à l’ionosphère (~20 à 300 km). Laštovicka et al soulignent que la tendance au refroidissement est exactement telle que prédite par la tendance à la hausse des gaz à effet de serre, et que l’accroissement de densité que cela implique est en train de provoquer la “chute” de différentes couches de la ionosphère. Cela a été mis en exergue il y a quelques années par Jarvis et al. (1998) et dans New Scientist en 1999 (et je m’excuse de leur avoir volé le titre de leur article!). Les changements dans le graphique sont liés au refroidissement constaté dans les enregistrements MSU-4 de la basse stratosphère (que ce soit ceux provenant des bases de données UAH ou RSS), mais les changements à ces altitudes (~ 15-20 km) sont principalement dûs à la raréfaction de l’ozone. Plus on monte, plus le refroidissement dû au CO2 est important. Il est intéressant de noter qu’un forçage solaire significatif aurait exactement l’effet inverse (il provoquerait un réchauffement) – encore une autre raison de douter que le forçage solaire est un facteur significatif [du réchauffement climatique] des dernières décennies. Mise à jour : la meilleure explication des tendances au refroidissement peut être trouvée sur ESPERE, en particulier la figure 3. Is there a simple explanation for why increasing CO2 causes cooling of the stratosphere? Yes, I believe there is. 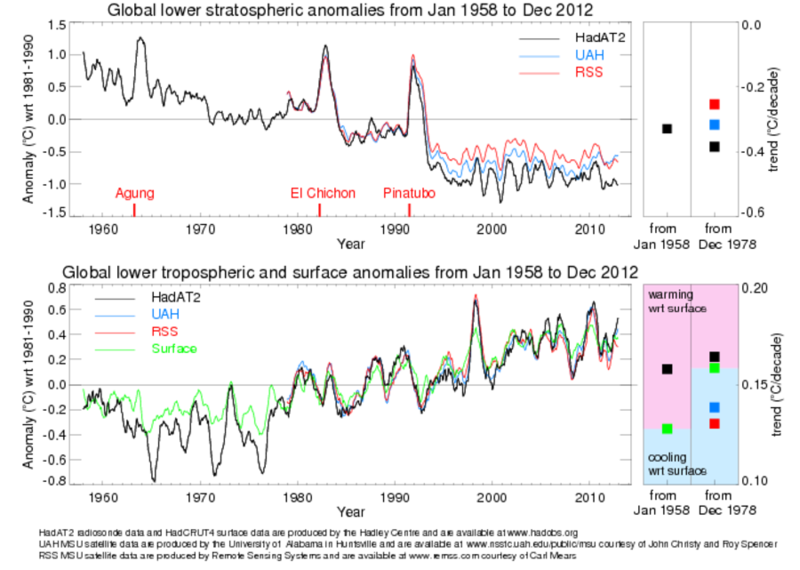 As tropospheric CO2 increases, more heat is trapped within the troposphere and less heat escapes the troposphere, resulting in less heat available for the stratosphere and beyond. Gavin, can you confirm this or is this too simple an explanation? How does this upper atmosphere change affect the Brewer Dobson circulation? #3 Stephen, here is another approach, the warmer the troposphere , the higher the tropopause, the colder the stratosphere! I like it when its simple…. Yet another easily relatable consistent piece of the puzzle. As the body of evidence presents itself, one is left to wonder what particular psychogical framework allows anyone to continue to obstruct meaningful social recognition of anthropogenic climate change? Realinging this point of view, and changing values that apply to our decision making process is an ongoing conundrum. The rising risks to humanity and Earth virtually smack of obviousness. Perhaps, in contrast to political truths, the climate problems are both absract and not relativistic, but “wait and see” is simply crazy, even if one holds doubt. How many bullets in the gun make for safe Russian roulette? troposphere via convection and increased upward IR. 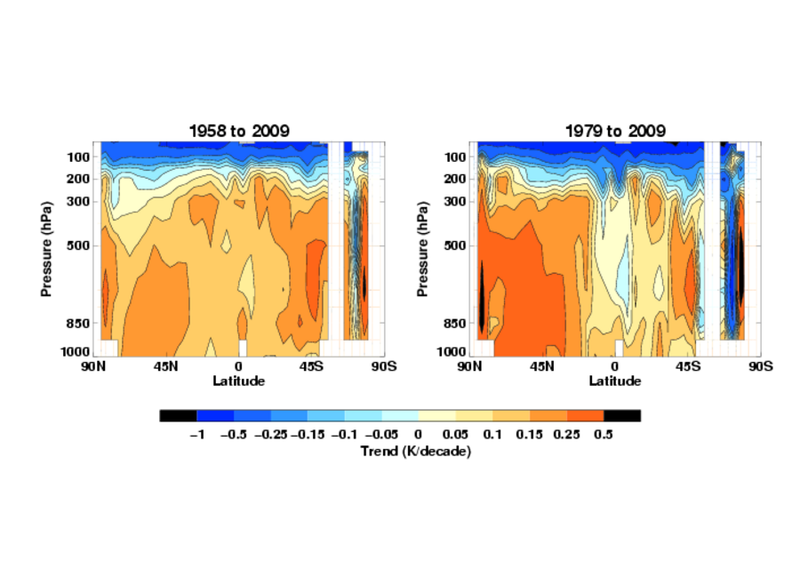 There is no brick wall at the tropopause, however. trop warming might smooth some of this imbalance. El Chichon and then again right after Pinatubo. with the general “shape” of temperature changes. cooling to take place above 60 hectoPascals. especially in the MSU era. Lastovicka et al. review thermosphere and mesosphere trends for “the last three decades” (no more precisions in their paper). So, concerning solar factor, their results confirm what we allready know from UAH and RSS cooling trends for stratosphere 1979-onward. What I miss is their assertion : “The dominant driver of these trends is increasing greenhouse forcing, although there may be contributions from anthropogenic changes of the ozone layer and long-term increase of geomagnetic activity throughout the 20th century”. Changes in ozone layer concern mainly the stratosphere and I used to think there are very few molecules (even atoms, in fact) upward. Concerning Earth magnetic field, a recent paper from Gubbins et al. showed exactly the opposite : a pronounced fall of geomagnetic field since 1840. Gubbins D. et al. (2006), Fall in Earth’s magnetic field is erratic, Science, 312, 900-902. Yes but the troposphere is rising!!! Thanks Eli for the links to the explanations! They fleshed out the ideas bouncing around in my head. Good article relating to James Hansens recent public addresses. What is Dangerous climate change anyway and what to do about it. I like the fact that a warming sun should means a warming ionosphere which in fact is not happenning. Comment # 3 is spot on. If you put more CO2, say, into the stratosphere then that doesn’t change how much sunlight reaches the Earth’s surface much and the surface warms up as much as before. But it does increase the amount of reradiated earthly heat that the troposphere absorbs, so that the stratosphere gets less heat from below, and cools. The algebra needed to do the calculation is straightforward, if local thermal equilbrium has been reached. But is that so? That depends on the rate at which the stratosphere reaches equilibrium once it has been disturbed, from below, and the rate at which the troposphere blocks the Earth’s heat from reaching the stratosphere. The first rate seems to be far slower because there are no winds in the stratosphere so that equilibrium can only be reached by diffusion of heat which is really slow; on the other hand we are pumpimg around 1.5 ppm of CO2 into the troposphere every year, over a base value of around 380 ppm. Surely that changes the heat input at a much faster rate? A clear answer to the question, and to the question of how much of the observed cooling is due to the above direct effect of the forcings, and how much is due to feedbacks, like the conversion of CH4 in the stratosphere to H20 etc. would be welcome? 1. First, the issue regarding the “temperature inversion” phenomena; even if there were a temperature inversion trapping the earths radiant heat at the Tropopause, there would clearly be indications of “Slugs” of warmer Tropospheric heat invading the Stratosphere. However, there is not a temperature inversion layer between the Stratosphere and the Mesosphere; therefore, there is a clear opportunity for atmospheric turnover or a horizontal rolling mix of the two layers at the boundary levels or the explanation for the “atmospheric waves”. There is no reason to believe that this heat exchange point needs to have any relation to CO2 buildup. So how is CO2 supposed to be related to the formation of the “atmospheric waves” or in my venacular Cyclonic and Anti-Cyclonic pressure zones.? 2. Second, so much is being made of the water vapor contribution by CH4 that it is amazing to me. Obviously the evidence of PSCs and now Stratospheric lidar is demonstrating the variability of the atmospheric boundaries and the moisture contained there. It is unbelieveable that there has been near enough CH4 released to; one, not be observable and two, to be significant enough to drive the water vapor high into the Stratosphere. So other then the “Slugs” of warmer tropospheric water vapor CH4’s contribution is miniscule. How is it that the AGW enthusiasts attribute such a water vapor contribution to CH4 rather then the mixing of the Tropopause and Stratospheric water vapor in a similar action as to the boundary layer temperature change at the Stratospheric and Mesospheric level? My apologies, I know that I must seem terribly naive; however, I am concerned that these things get attributed to CC or ACC without a examination of the mechanics for the means that accomplish the defined ends. I know that I am a simple layman and that every attempt is made to make the results of highly complex calculations palateable, even to dolts like me. I have a hard time swallowing a lot of the theories that seem to pop up here, it is as though the ideas have not been thought through. Is it a issue that the desire is to unfold the data slowly for wide spread understanding, or is it really that the level of science is not there yet? AS long as we admit that no solar or albÃ©do variances are involved in actual climate changes, green house gases can only assume changes or transfer of heat and temperatures between different units of the climatic system. In that optic, is the cooling of the upper Atmosphere sufficient to counterbalance the warming of the troposphere, or is it necessary to investigate variations in the ocean temperature? There is no single proof for cigarettes causing cancer and there is no (and never will be) single proof for CO2 causing climate change. But who will today doubt that cigarettes are at least unhealthy? Re 16# Well, if not, hydrogene (as sometimes proposed), if not nuclear energy (not enough secure) and certainly not gas, coal and oil, what then? (Solar, water and wind energy is simply not enough…) Moreover, the energy demand, not surprisingly, will grow in let’s say 20 or more years? delightful … it is right and fitting that there be should be literary connections, objective correlatives for chicken little, some yeast in the (oh so difficult and depressing) dough, thanks, be well. Outside of an increase in temperature, I don’t see any particular reason to expect hydrogen-based fuels to do anything to increase the concentration of water vapor in the air. The absolute humidity is set by temperature & pressure; and why do you think that the relative humidity would change? I expect that anything extra would precipitate out. Thanks to Eli Rabett for the link – that seems to clear things up. It does seem at first glance that a warm troposphere would warm the stratosphere, but the explanation that more of the earth-sourced infrared radiation is absorbed lower in the the troposphere by higher levels of CO2 makes sense if one thinks about the thermodynamic losses involved in the CO2 re-radiation processes; some of the earth-sourced infrared is transformed into kinetic energy and only a fraction is reradiated as more infrared radiation (if I’m understanding correctly). The stratospheric cooling does seem to put another nail in the coffin of the solar variability hypothesis. As far as solar and wind ‘not being enough’ (#16, #17) it really depends on what kind of technology you have and where you are on the globe. Capturing just a tiny fraction of the incoming solar energy is enough to meet human energy needs (and wind energy is a product of the incoming solar energy as well). The fact is that the US isn’t investing in renewable energy technology and development, unlike countries like Germany and Japan (and Australia). Imagine a system powered by 11 MW worth of solar panels in your own city, like the one being built by Powerlight in Serpa, Portugal. This project will allow a certain proportion of fossil-fuel powered electrical generation to be taken offline during the daytime, reducing CO2 emissions and providing more energy independence for the region. Powerlight is a Silicon Valley business (soon to be renamed Solar Valley); too bad they have to go to Europe to find business, isn’t it? Future technological developments may well include hydrogen storage solar systems; one can imagine a closed system (no H2 leaks) in which solar energy is used to split water to H2 and O2 during the daytime, which is then recombined to generate electricity and reform H2O at night, and so on. Solar is definitely capable of providing enough energy, especially when supplemented by wind and biofuel technology. Just a few questions, you assert that there is sufficient solar energy to meet demand. Could you please assist me in seeing your view point? From my view point the average family of four requires approximately 30 KW/day in a single family home at about 35 Deg. N/S on average. There should be an increase in demand of about 8 KW per day during the summer and about 12 KW per day in the winter. The variability below or above this latitude would be about 12 additional KW above during the winter and about 8 KW above during the summer. We have an incoming energy level of about 326 Watts/meter^2 at this latitude, meaning we need about 9 square meters at 100% conversion efficiency for 12 hours during the summer and about 14 square meters during the winter. Of course the energy converion by an economic solar panel at this lattitude would be about 12%. And if you are converting it by hydrolysis you need to drop the 12% to 12% or around 1.4% just for the collection of the energy. That means for at least 30KW you will need nearly 2000 square meters during the winter, (Estimating that the direct solar input is less then 1/2 during winter). This would seem to indicate you need around 11,000 sq feet to meet the average winter demand. There is not enough roof space on the average home to meet this demand. So, you say okay, lets supplement it with wind energy. Well you have to consider that the wind energy is directly related to solar energy and given the average 1/2 acre required for solar power you need a little more ground space for your 10KW Wind Motor (BTW, less then 10% of the US population is located where there is a possibility of a 12 MPH wind every day for at least 6 hours from which you would need to extract about 36KW per hour.) The greatest density you can arrange wind motors is in a 3.4 acre grid design. The average home owner has less then 0.25 acres of land with their single family home. Of course if you increase the efficiency for the power demand by 100% you can reduce the solar panels so that they cover the entire lot the house is on; but, there will not be any grass or trees as all the incoming energy will be necessary to power the house and home. (Do you think you can increase the average efficiency by 200%? The EPA has to pull eye teeth just to get a 10% improvement in 10 years how do you expect to get 200% in six.) This does not take into consideration the amount of physical space required to harvest enough solar energy needed for multi-family residences. Finally, lets move on to biofuel, either by buring your wastes directly on your property or by extracting it from your septic tank biodigester (See the vent pipe on your roof try gathering that gas and heating your home with it.) At best you might be able to extract 30,000 BTU per day or enough fuel to heat the average home for 30 min. to 22 Deg. C (from a starting temp. no less then 20 Deg. C and an outside temp. no less then 10 Deg C). This may be helpful: a fairly old page discussing the layering at and above of the stratosphere. “… The true structure of the upper atmosphere was revealed by a series of experiments that followed de Bort’s pioneering investigations. The stratosphere is now known to be a region of intense interactions among radiative, dynamical, and chemical processes in which horizontal mixing of gaseous components proceeds much more rapidly than vertical mixing. Contrary to de Bort’s early conclusion, the stratosphere is warmer than the upper troposphere: temperature above the tropopause increases slowly with height up to about 50 km. However, an explanation for this phenomenon was not found until 1930, when a plausible theory was put forth by Sidney Chapman for the existence of a stratospheric ozone layer. Absorption of solar ultraviolet energy by ozone produces most of the heating in the middle atmosphere. “Above about 50 km in altitude, the ozone heating effect diminishes in importance because of falling ozone concentrations, and radiative cooling becomes relatively more important. The temperature thus begins to decline again with altitude. This effect marks the stratopause–the top of the stratosphere and the bottom of the mesosphere. Rocket experiments in the 1940s and 1950s showed that the temperature falls to -70deg. to -140deg. Celsius in the upper mesosphere, depending on latitude and season. –from: National Aeronautics and Space Administration (NASA). 1989. Upper Atmosphere Research Satellite: A program to study global ozone change. Washington, D.C.: National Aeronautics and Space Administration. I think a while back the skeptics and denialists were actually using the cooling in the stratosphere (or perhaps some other part of the atmosphere) to claim AGW was not happening. I also remember them, I think it was Patrick Michaels, using some atmospheric cooling as evidence against AGW, but (if I remember correctly) the calculations were off regarding how high in the atmosphere that cooling was happening, and once rectified, it fit with what was expected from AGW. I also remember making an argument, similar to Stephen’s (#3), when denialists would confront me with that cooling evidence as proof AGW wasn’t real. So glad we have the RC folks. Now all I have to do is refer people to RC. What a relief! Thanks, guys. Re the “sky is falling,” is this what was portrayed in CATEGORY 7: THE END OF THE WORLD? (http://www.imdb.com/title/tt0468988/) A scientist in it claimed something like ice or glass-like substance was falling from way high up due to GW (maybe they got the idea from the Jarvis, et al., article). Another thing. Last hurricane season (before Katrina), when Emily came close to us, the news station showed tremendous hailstones falling in Brownville, TX, breaking windows. The weatherman said he had never heard of hail falling during a hurricane (& someone here on RC verified that it was unusual). Could this phenon be at all related to the “sky is falling” thing presented here? I said that sufficient solar energy was available, not that the economic and industrial system as it currently stands is capable of capturing that energy. Have you considered why solar panel costs are so high? The main reason is a lack of supply, due to a lack of industrial manufacturing capacity. Furthermore, if you are talking about a 70% reduction in CO2 emissions over 1990 levels (a reasonable target, but I do look forward to seeing the new IPCC outcomes for different emissions scenarios) then you can still use fossil fuels to meet that 30% demand. I’m also not quite sure about your units; energy use is measured in a wide variety of units from BTU’s to kWH; your use of KW is a power measurement. One KW of power for one hour gives the energy unit kWH. There are many off-the-grid homes in California that operate on ~8 KW systems. You have to conserve energy (for example, use a laptop computer and energy-efficient fluoresent bulbs) and that means adopting a different attitidue towards energy use. Imagine if you had a small monitor on your wall that told you how much energy you were currently using, your energy usage to date for that month, and your estimated bill. Why don’t we all have such a device on our walls? If you want more on the topic, see the excellent text. For wind energy, take a look at the recent NASA study at http://alt-e.blogspot.com/2005/05/wind-energy-nasa-funded-study.html There are many sites on biofuels as well. There is some connectivity to the climate issue in that ‘solar insolation’ is of fundamental importance to both topics. Glad I wasn’t the only one concerned about the energy unit being thrown around. Dave – water heating, space heating and space cooling account for at least 60% of emissions generated from the typical household. Through appropriate building design, behavioural change and demand management (this does not mean living like a cave-man, just using resources efficiently) and appropriate matching of energy source with demand (i.e using solar radiation, not brown coal fired electricity for water heating), it is possible to eliminate these emissions completely. I appreciate that design change options are limited for existing building stock however they are only limited by our inability to properly account for the cost of emissions and channel investment into productive outcomes. Re #22: Your analysis seems to be one in which the assumptions are chosen to justify the conclusions. You say “From my view point the average family of four requires approximately 30 KW/day in a single family home at about 35 Deg. N/S on average.” Suppose we question that 30 KW/day assumption. What exactly is your family of four doing with all those kilowatts? Are they used in things that need to be done for their comfort & convenience, or are they mostly wasted because energy’s so darned cheap that it makes more economic sense to waste than to spend money – or even thought – on energy efficiency? If instead you reverse the thought process, and say “We have X amount of energy available for our house, how do we use it to live comfortably?”, you might come up with different answers. Lots of people have found it perfectly possible to live off the grid. Yes, you are correct that many homes can be powered by 8 KW solar systems as they translate to between 32 and 40 KWH over a 24 hour period at around 30 Deg. N. I still defy you to install a 8 KW solar panel/storage system on the average home site to meet the 24 hour electrical demand, even with LED light bulbs and 100% increases in energy efficency of appliances, economically. Most systems are not that complicated to comprehend, as you suggest, there are any number of excellent energy budget planning guides available today throught either the DOE or even your local utility. Old Timers like me had to rely on “Mother Earth News” or “Popular Science” and “Popular Mechanics” or “Science and Mechanics” as our bibles for the exploration of alternative energy systems and technology. As to renewable energy there are a number of blog sites that are related; however, most are related to beginners and old salts like me end up raining on their parades. Seems that reality and pragmatism seems to conflict with idealism and innocence. Re 12, 13 & 23: Is the stratosphere as isolated as assumed? Back in the late 60s I was out at about 18W over the Atlantic and saw, for the first and last time, a nacreous cloud, up around 70 to 80 thousand feet, nearly twice our cruising altitude. The next flight was along the same route, one or two days later, and the nacreous cloud had gone but, in the same general area, there were noctilucent clouds shining in the light of an invisible sun, much higher, certainly well over 100,000 ft. I’ve often wondered if the conventional explanations of noctilucent clouds are right. As an exercise in sideways thinking I have constructed an alternative theory of what is causing global warming, at http://www.floodsclimbers.co.uk. I find most new facts that pop up can be fitted into my theory with a little bit of wriggling, particularly as numbers seem in short supply in many of these ‘oh my Gard, the sky is falling’ headlines that journalists love so much, but I must admit that this one has me scratching my head. Incidentally, I have been unable to find out if the models which are producing the GW scenarios include some allowance for the fact that the ocean/atmosphere interface (the boundary layer, so called, an irritating nomenclature as the words already have a technical meaning) was changed drastically from about 1850 onwards by surfactant and oil spill pollution as the petrochemical industry and petrol engine technologies began to hit their stride. I hope so, otherwise I can’t see how their results can be any more accurate than my own hand-waving explanations. Re #30, Julian, (I checked out your web site,) it seems like a reasonable conjecture, there is nothing wrong with that, conjecture is one of the components of the scientific endeavor. Conjectures fly or sink depending upon the measurements, that is the role of the Climate Scientists, hopefully one of them will respond to your post, I am keen to hear what they have to say. My gut feel however, is that your fundamental assertion for the cure of global warming is wrong. It seems to me, in spite of the noise from the climate change skeptics, pretty simple: nature sequestered carbon over hundreds of millions of years, keeping the earth comfortable in spite of the very slow increase in the suns flux over those millennia, and now we are undoing all of nature’s work in order to drive our economy. Those folks that like the economy the way it is, don’t like the idea that we are causing damage to our home, that is what really drives their skepticism, not the science. Here in Canberra, it is just dreadful, the relative humidity is so low and this November has been so hot. I washed a cotton blanket the other day and after putting it out on the ‘line it was bone dry in a little over an hour! And this is just November! Maybe you are correct that we need to discuss a little about conservation, a change in technology is a basic requirement to achieve that dream. You will need to abandon heated water storage as even a consideration. It is a clear direct loss unless it is also employeed as a suplemental heating source. However, the facilities required to heat water to just sit is wasted energy. You would be much better off to directly convert the energy to electricity and use a point of use heating system. (Hence, a reduction of 60% of wasted energy; but, a high demand for the total home requirements still. And yet with the changes that have been put in place, the actual reduction while keeping the same standard of living and matter of convienience, has been less then 15% of the average home budget. So unless you make the move to live in a cave and drop your personal demand to susbistance levels you really will not get a positive effect. The point is you are suggesting that people move backwards in their lives. Not only economically, in that the costs for energy resources maintains pace with the inflation rates; but, also in how they live their lives. You want the energy equation to become a larger concern, (as if there is not already enough for us to be concerned about). If you truely want to be effective at making a positive change, devise cost effective means for non-intrusive replacement of current technology that can reduce the demand. 30 KWH/day is an improvement from 36KWH/day only 10 years ago, you are right we can do better. We might be able to pull it down to 26KWH/day; however, I will be impressed if it will reach that level in my lifetime. I too have reviewed your post and URL and have to say I am amazed that you seem to attribute so much to surfactants. If nothing else these chemicals would actually reduce the surface tension at the ocean-atmosphere interface and allow a greater amount of water vapor to move into the atmosphere. As to the Oil “on troubled waters” most seaborne oil volatiles quickly evaporate so that you are generally left with a tar like sludge that slowly sinks or washes ashore. However, that said, yes pollution of the ocean is one of the primary concerns many share, in that the limitations of an impact on the natural resources of the planet is a respectable goal. However, to attribute the whole of the observable evidence to one source, only continues the chain of thought that got us to, what I consider an imbalance of blame, being awarded to CO2 participation in light of very little total data. Climate Change is not made up of one thing. As Hank Roberts and I discussed in “How Much CO2 emission is too much?” Phytoplankton do seem to play a part; however, simply feeding them a little iron is not going to rescue the planet. Now if you were to strip the surface of the planet of it’s vegetation in a massive wildfire, then watch the silicates, solid carbon, phosphates (Pot Ash) and iron oxides run off into the ocean where the phytoplankton can thrive on the added nutrients and be shaded under the light colored high altitude ash for a few years, now you are talking. Humans have made a great number of impacts on the land stretching from prevention of catastrophic wildfires, to Urban Heat Islands, to denuding the land, and pollution of the air and water. However, most every living thing has an impact on the environment. Most though are very temporary, though some of mans now last for millennia. It is the total population density that has the largest impact. When the population exceeds the ability of the planet to absorb the day to day existence of the organism on it’s shell it has a tendency for those natural processes to breakdown. Re 31: I’m with you on this — we need the numbers. The great problem as I see it is that we don’t know how many numbers we need. I suppose the way ahead is to keep refining the models by adding more numbers until they produce perfect answers. It surprised me as well. I would have assumed that oil film would be the important one and perhaps it is. Anyone with a little maths can work out how much oil is needed to cover the oceans, and even pessimistic assumptions of biodegradation gives me an astonishing rate of coverage. Most of the oil, by the way, comes not from accidents or ship spills but down the drains — it’s cars and lorries spilling a little here and there on the roads. Combined with the data from the Clapham pond you can reach,(using units which at one time yielded acres per fortnight to my great amusement, thank you Benjamin Franklin,) I hope, the same conclusion as I, namely that by the time the petrochemical industry hit its stride it had altered the ocean surface catastrophically. I put the year at about 1850. Oil and surfactants really spread a long way, even comparitively small amounts. I see an analogy with the ozone hole, where a comparatively tiny input hits a sensitive spot in the world’s balancing systems. Incidentally, although I have seen articles which say that we don’t know what would happen if we change cloud cover, the type of cloud cover that would be affected by the reduction in wave breaking is the same as that proposed by Salter and Latham (I do not have an online reference for their proposal of using wind-powered trimarans to produce hygroscopic particles from seawater, but find it if you can as I cannot recommend it too highly). They talk of increased albedo and a reduction in temperatures to buy time with only 50 tonnes per second compared with a natural production of 40,000 tonnes per second, so the cloud/temperature connection is obviously very sensitive. Natural surfactants and oils complicate the picture. Numbers, we need numbers! Does this theory explain something that has puzzled me: the Mauna Loa figures show a steady increase in ppm CO2 while mankind’s CO2 pollution has soared in a very non-linear fashion. Any ideas? It would seem to predict rainfall reduction over the last 150 years in those land areas where on-shore winds and orographic uplift are the rainfall drivers. I leave other falsifiable predictions to the intelligent reader! Yes, it started as a spoof because I was fed up with the non-numerical handwaving that goes on about this vitally important subject, but as time went on I became rather enamoured with it — my son tells me this is a classic fault in a bad scientist. Just some thoughts on the solar-energy issue. I haven’t posted on this website before, but it seems to me the solar-energy problem would be solved if we stopped thinking of roofs as necessarily flat surfaces. What if we had cup-shaped forms plated with solar panels? or dome-shaped forms, covering the roof? Why stop at the roof? Why not use the sidewalk or front lawn, if possible? The driveway? I mean, shouldn’t we think outside the box? What about forcibly limiting consumption by linking a particular outlet to a particular set of panels? I mean, it just seems like there’s a tendency to be defeatist rather than creative in approaching these problems, even on this blog. Dave, are you referring to Homo Economicus, the all knowing, all rational decision maker? And is that a 15% reduction in cost? Emissions? Or energy use? In Australia, Heating water accounts for almost 30% of household emissions. Solar hot water can pay itself back in 3 years, maintain your standard of living and reduce operating emissions by almost 30%. I suggest that most countries with a large percentage of their electricity provided by coal could do similar. A Grid interactive PV system in our country will typically pay itself back in 15-20 years with a capital outlay (after small subsidisation) of around $15,000. This is in Australia which enjoys ridiculously low electricity prices. That system will supply about 6kWh a day. My girlfriend and I have a great standard of living and use less than 2kWh a day. We live in a large modern apartment, we almost always cook at home (using gas), we have a fridge, we use lights often, we shower everyday etc etc. Both solar heating and electricity are non-intrusive and economically sound investments. Or do you disagree? However most people in Australia will spend at least $15,000 on a car which depreciates in value, costs bucket loads to run and from a lifecycle perspective is probably as bad for the climate as you can get. My girlfriend and I donâ? ?t have a car. We either walk, run, or use public transport. After doing this for a year now, I have never felt fitter and healthier. I can still see movies, go out to bars and clubs, go shopping, etc etc. I donâ? ?t live in a cave and my standard of living is arguably better than it has ever been. Macro and Micro economics assume a model for human decision making and impose those assumptions on the economic system. If you studied history, philosophy, psychology, sociology and economics (and economics used to consider all these elements) you might realise that human behaviour is a bit more complex than â? ?Me need heat â?? me turn on electric heaterâ??. The other fallacy in the argument you run is that you imply the onus is on households to cut their energy/emissions. This is an argument well run by governments and big business to make people feel helpless while they continue to exacerbate the problem. There are huge benefits to be had in commercial buildings and transport for instance. However this is a blog site about climate science, not energy and politics so I will leave it there. In short – I will never understand the logic of your argument. We need less people telling us how impossible it is to reduce our emissions and more people pointing out how easy and beneficial it can be. As to PV systems, the average cost here in the US for 4kW set of 18% efficient panels would be approximately 43,000 USD. Running at full power for 8 hours will deliver the roughly 32 KWh necessary to meet the average US home of 4 electrical energy requirements. The space requirements runs at about 100 meters^2 to be able to keep the insolation angle within the roughly 30 Deg. optimum angle. Granted, nearly 20% of the US population live within public transportation distance of their work. The remaining 80% is where there is a problem. Those who live close to work here, generally have the income to support this capability. Most US citizens don’t have the money and must travel distances to have the income necessary to support a home and a family unless you want to live in Urban Blight or unsafe public housing. The point is, the choice of the solution is in the hand of the individual within limitations. To go to the extremes offered by most alternative solutions exceeds the cost of economic returns. In short, the solution is a matter of priority and when it becomes a matter of eat or environment, the environment will lose. Finally, Tosh you are correct it is time to put some creative thinking to the task. Apparently those of us who have been in the alternate energy solution research appear to not have cracked the egg in the last 30 years, hopefully, your generation can. You are correct though, this is not the venue for further discussion. If you wish, I will be glad to discuss further, I can usually be found at ldavidcooke@yahoo.com. Re #32: You say “Maybe you are correct that we need to discuss a little about conservation, a change in technology is a basic requirement to achieve that dream.” I disagree. The necessary technology is here now, though of course it can always be improved. What’s lacking is any sort of impetus that will get the average person to use that technology. Consider your example, the American habit of stored hot water (something that it seems the rest of the world doesn’t do, BTW.) There are a whole range of “technologies” that will conserve energy here, ranging from simply turning down the water heater’s thermostat (which also prevents those uncomfortable moments when you accidentally bump the hot lever when showering :-)), up to installing solar hot water. As for whether one is moving backwards or forwards in one’s life by using more or less energy, that’s a matter of opinion and taste. The thing is, many people in the US and the rest of the developed world simply aren’t aware that there are alternatives. They’ve been raised with a particular set of cultural attitudes, which have been reinforced by advertising & mass media, and don’t have experience of living outside this box, or of how much more comfortable (IMHO, anyway) it can be. This is a good post by the way…, though the technology is here, even with the perceived added value of the lower environmental impact of the solution sets it still is not enough to convince “decadent Americans”. By the same token, these solutions are not attractive to anyone else either. As to water heating, most systems in my area are set at less then 45 Deg. C. However, most home owners are now considering going to the Point of Use water heating units which removes the waste of energy and reduces the cost of additional plumbing. Can you explain what you mean by Solar Space Heating? The best translation I can get relates to insolative passive solar heating with radiant energy sinks. Most of the home designs around here are Williamsburg, Cape Cod or brick Ranches which do not convert well to this technology. As for adopting technologies that deliver a reduced “carbon foot print”, many around here would jump at the chance to not have to send the spouse off to work or to quit their second job. The addition of Solariums or Sunrooms were considerations at one time; however, with over 223,000 NC jobs going overseas since 2001, the funds for these investment are pretty slim. As to awareness of alternatives, the local news station runs a weekly segment that talks about different means to reduce our “foot print” on the face of the planet. I don’t think culture has nearly the impact you suggest, instead it is a matter of changing to a different energy technology. It seems the problem is everyone is waiting for the promises to reach fruition and the truth is they will not occur unless we implement these technologies today. However, no one wants to jump into the pool only to have to forklift it out and spend that same amount again in 6 months because the promised technology has suddenly been delivered. But I know I’m right! Seriously, having a quick look round I see that I’m not alone in using the word in its common rather than scientific form. I think the language is changing as we speak. Just as well: a lot of hot air but not a lot of proof runs through much of this vital debate. – I don’t understand what you’d be trying to accomplish with funny-shaped roofs: the amount of solar energy impingent upon a system is proportional to the cross-sectional area, relative to the direction from the sun. – Limiting consumption by availability of power: So that means that if a cloud passes overhead when I’m listening to a CD, the music dies. You know, there’s an experiment where they’re trying that kind of approach to controlling power utilization: It’s called Iraq. Reviews have not been too good, so far. – I guess there’s nothing wrong in principle with putting photovoltaics in sidewalks, but you have to protect them somehow. They break. Thinking outside of the box is fine. But it helps if you stay on the same planet. I’ll ask again about the large hail falling in Brownsville, TX (latitude 25.9N) during Hurricane Emily in 2005. Could this have anything to do with the stratospheric cooling & perhaps increased WV up there? Or is that just too high up to be a part of a hurricane? The weatherman (& someone on this site) said it was highly unusual for hail to fall during a hurricane. I found this at http://www.ucar.edu. Is it true? It’s part of an article about how the models perform poorly wrt cloud effects. Bursting bubbles produce 5% of the world’s cloud-forming nuclei. (I read it on the web so it must be true…). They probably therefore account for something over 10% of low-level marine stratocu. How do the models run if you decrease the heat input by that amount? Is there satellite data about stratocu cover over the affected area? Has there been some change in the oil sheen/surfactant pollution level in the Pacific? if so that would increase wave breaking and subsequently increase low level stratocu. If so, the Pacific heat sink is no longer difficult to explain. Must be a regional difference. You imply that you’re in North Carolina, and I haven’t been there in a couple of decades at least. Landscape & other outdoor lighting is quite common here (Northern Nevada), and other places I’ve been in the last few years. The upscale houses may use more of it, and more artistically arranged, but the majority of houses will have some outside lights left burning all night. Then there are the empty parking lots, brightly-illuminated at 3 AM; the high school and park athletic fields that turn on floodlights at 5 PM in the summer, and so on. Your concern over landscape lighting may be a little misplaced. As a general rule most systems are low voltage and use a maximum of 100 watts or roughly 1kw/day. Most of the new lighting systems are actually solar powered using the newer 100,000 mcd white LEDs. I had been looking into these for converting them over to a light bulb replacement as most commercial solutions exceed 25 USD. A Bulb base, a full wave Diode rectifier bridge rated at over 600 Vdc PIV 1 amp, a 5.1 Volt 1 amp zener diode,a 470 ohm 1 watt resistor (for 120 vac twice that value for 240 Vac),about 10 LEDs (available from ebay) and a frosted plastic cover can make about a 4.5 watt light source with about a 100 watt illuminance. 10 times the amount of LEDs can make replacement bulbs for sporting events or public gathering places. If you use the correct balance of red to green LEDs you could even use them for street lighting where they would have more of a sodium lamp characteristic and reduce the amount of light pollution that seems to interfere with star gazing. Plus their directivity reduces scatter, putting light on the ground only where it is desired. Okay, as Hank Roberts says we have gotten way off the mark here. Let’s see if we can get back on topic regarding the drop of the mesosphere into the stratosphere during anti-cyclonic events and a clear rise of the tropopause into the stratosphere during cyclonic events. One of the hypothesis’s I had raised in one of the earlier posts regarding hurricane development related to the apparent increase in energy lately related to a increase in the migration of the mesosphere feeding the anti-cyclonic down drafts that surround the base of the cyclonic zones. These coupled with the increased intrusion of the tropopause into the stratosphere appears to cause a change in the saturated adiabatic proccess and allows a greater updraft resulting in an increase in the fall distance of the condensensing water vapor resulting in high average winds and lower eye pressures. Many had been attributing the increase in storm intensity to increased SSTs; however, my observations are that these are actually an artifact and not the driver of the observable evidence. There was a recent report, I think Hank may even have directed a poster to this earlier in another thread in regards to the “Head in the Clouds” sidebar item. From what I could gather there it appears that SSTs alone would not provide the impetus for the increase in storm develpment. Did I read this wrong? That is one of the strangest comments I’ve seen – do you have some unknown network of satellites taking measurements of SST’s that you’re not sharing with anyone else? Lots of big words, but absolutely bizarre – mesosphere feeding into troposphere and affecting hurricanes? That’s not even wrong – it’s nonsense! The mesosphere is very thin and it has essentially no effect on the global radiation budget, for starters. Hurricanes are very complex beasts, but the energy source is the warm sea surface. What keeps the hurricane going is the cold upper atmosphere and the warm sea surface (and a warm mixed layer of the upper ocean will sustain the hurricane) – just like a Carnot heat engine. There are other requirements for hurricanes, however – a southward shift in the jet stream in El Nino years can disrupt the vertical structure of the hurricane, for example. What happens to the warmth from the sea surface? It is mixed out at the top of the hurricane system into other weather systems and becomes part of the net equator-to-pole heat transfer. The entire latter part of your post seems to be a replay of Richard Lindzen’s old arguments about an overturning atmosphere releasing heat and so cooling the climate; this is the notion that the heavens will part and release energy to space – entirely wrong. Lots of impressive words, but not much else. Lindzen also suggested that water vapor would act as a negative feedback on global warming because the upper troposphere would dry out as it warmed (which also fits the ‘sky will open up’ ideas) but the fact is that the troposphere has gotten wetter. Lindzen has been proved wrong on every point. ” the cost-effectiveness of many advanced efficiency measures is very much dependent upon whether the measure is a retrofit … or …installed at a time when the baseline measure would be replaced anyway …. the most promising measures include laminar flow aerators, indirect water heaters, duct sealing, wireless thermostats, and high efficiency refrigerators (versus existing). Might be worth asking there, on that site, in the available discussion threads, as a courtesy to the blogger who’s trying to provide a clear and focused discussion of exactly this area.